Amaze's Compass Card was launched in Brighton and Hove thirteen years ago and is a national model of best practice when it comes to providing leisure discounts and opportunities for children and young people. We were delighted to get involved with Amaze just over a year ago to develop the Amaze Compass Card app which brings leisure discounts to the mobile phones of parents and young people eligible for Compass Card discounts and offers. 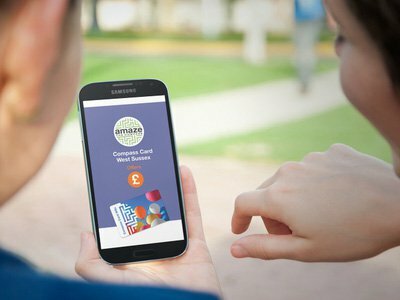 Now, commissioned by West Sussex County Council, Amaze has teamed up once again with us to launch the popular leisure discount card and app for 0-25s with additional needs in West Sussex. Compass Card West Sussex was officially launched on Friday 8 April with a special Fun Day at Lodge Hill outdoor centre near Pulborough. We're delighted with the response from families in West Sussex. We've issued over 600 Compass Cards in just two months and over 300 people are using the Amaze Compass Card West Sussex app.